Dr. Kellyann Petrucci is a well-known weight-loss specialist who has helped many people (especially celebrities) lose weight quickly. 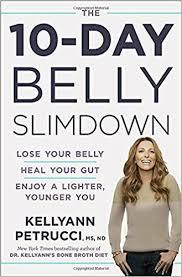 Her secrets are explained in The 10-Day Belly Slimdown. The diet consists of four phases throughout the day. The main factor in the diet is bone broth. There are instructions for making your own bone broth (which can take up to 8 hours) or, helpfully, Dr. Kellyann sells broth on-the-go packets on her website. As well as a structured daily plan, the book includes a section on approved foods that you can have during the 10 days. Many recipes are included in the book. Each recipe includes detailed preparation instructions and notes about how the various ingredients are helpful in the diet. Unfortunately, as with most recipe books, it's unlikely that many of the ingredients will be found in your kitchen already. In three recipes I found by opening the book at random, each one asked for at least one ingredient I found a little strange, including monk fruit sweetener, Celtic salt, fish sauce, Korean red pepper flakes and daikon (? I have no idea and I'd be willing to bet my local grocery store doesn't carry it). For inspiration, the book also has many Success Stories showing before and after photos of people who were able to lose weight and inches in 10 days. In short, someone who is willing to commit to the plan and buy all the ingredients will likely be successful. I just wish the ingredients in the recipes were a bit more pantry-friendly.